Coca Cola UK is launching Schweppes Christmas Entertainment, a new advertising campaign tapping into iconic drink brand’s rich history of witty, quintessentially British humour. 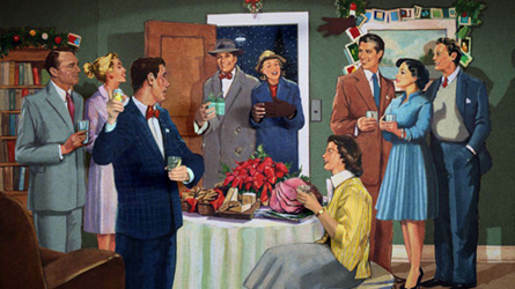 The campaign, broadcast on UK television from November 16 through to the end of December, features ten 10-second idents, along with a “Have Yourself a Merry Little Christmas” series, adding humour to 1950s illustrations with the use of live action arms and hands. The campaign. developed at Mother London and helmed by Tom Kuntz, takes inspiration from classic Christmas illustrations of the 1950s, drawing on quintessentially British scenes and transposing them to a contemporary setting. The ads feature the recognisable voices of cult British comedians including Smack The Pony star Doon Mackichan, and Martin Freeman (The Office and Love Actually). Did someone order a husband and wife stripogram? Darling someone has to eat those! Don and Tabitha you’re just in time. I’m about to hose down Felicity! You are in a deep sleep…. Come on put your keys in! The Christmas Entertainment campaign was developed at Mother London. Media was planned by Vizeum. Filming was shot by director Tom Kuntz via MJZ. Editor was Steve Gandolfi at Cut + Run. Post production was done at The Mill. Audio post production was done at Grand Central Studios.